Our wallet is made of 100% top grain cowhide genuine leather hand-crafted by the finest workmanship,If you aren't 100% satisfied with the quality, please feel free to contact with us, we will make things right to promise you a free replacement or money refund, getting it with confidence, your purchase is Risk-Free now. Stylish and classic style of our Clutch bag making you outstanding and unique from others.Multifunctional structure keep your daily essentials neatly organized. Dimension: L 7.5 x T 0.9 x W 3.9 inches (L 19 x T 2.2 x W 10 cm), it is a perfect size for putting in your handbag or holding in your hand. Many colors for your choice: Black, Red, Blue, Pink, Purple. ♦ There may have 1-3cm size error due to different manual measurement ways, the figure shows for reference only. ♦ Slightly color difference may due to different computer monitor settings and different batches of material. ♦ To maintain the genuine leather, we should keep it away from sharp items, oil, chemicals, humidity and heat source. Clean it with dry soft cloth when got stains. ★【High Quality Material】: Made in top grain cowhide leather, with durable fabric lining of RFID blocking function, smooth light gold zipper and Four-clover embossed material, it looks very beautiful and Luxury. ★【Large Capacity Structure】 : with 2 big currency compartments, 2 big bill compartment, 8 credit card slots, 1 cell phone pocket, 1 hidden ID window. 1 middle zipper pocket, 1 detachable wrist strap as you like, it will meet all your needs to carry all your daily stuffs easily, such as 5.5 inch Iphone , Id cards , credit cards , cash , tickets , key chains , earphone or driver license . 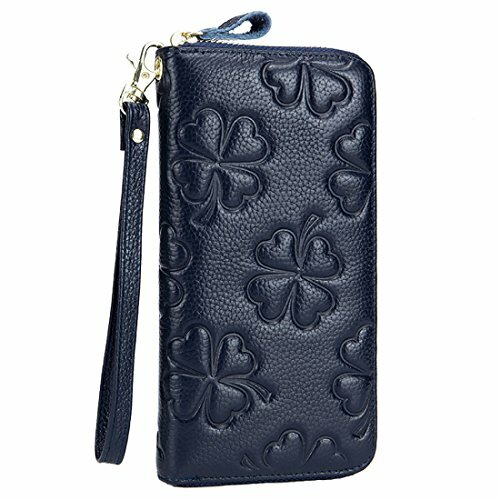 ★【Fashion and Classic Design】: The embossed Four- clover means lucky, it will bring you good luck and fortune, whatever the fashion style change, the multifunctional structure and embossed Four-Clover will keep the wallet more luxury and classic. as the time goes on, you will like it more and more. ★【Suit for Many Occasion】: This leather clutch bag is a perfect choice for women on Business & Casual, easily to carry on streets, commuter, traveling, office and parties or other daily occasions, making you full of ladies' charm. It is also a ideal gift on Birthdays, Anniversaries, Valentines day, Christmas, Mother's Day, Graduation or other special occasion. ★ 【Safety & Privacy】: Equipped with advanced RFID security technology by using unique military-grade blocking material to prevent unauthorized access to personal information.You don't worry about identity theft predators around every corner, with zipper closure can prevent the credit card missing. If you have any questions about this product by HASFINE, contact us by completing and submitting the form below. If you are looking for a specif part number, please include it with your message.